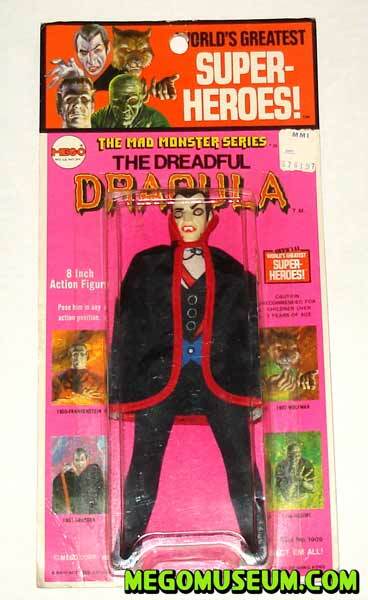 Being the only character in the mad monsters line who is supposed to resemble a human, Mad Monsters Dracula comes off as more cartoony than the rest of the characters in the line. This isn’t helped by his screen printed outfit (similiar to the Joker) but there is a certain child like charm to the character. Of all the monsters, Dracula is the most difficult to obtain in most forms, it’s likely his case pack was lower than Frankenstein or the Mummy who were seen much more frequently. 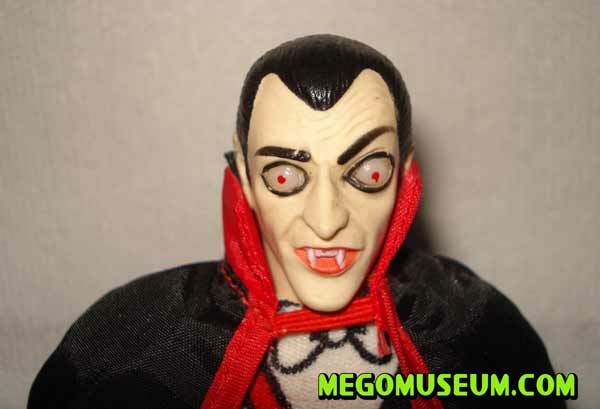 Smooth Haired Dracula is believed to be the first version of the Mad Monster figure, even though they were trying to be generic as possible the theory was that by using smooth hair Mego feared they were infringing upon Universal copyright. When this was discovered the figure was first replainted (see below) and then resculpted to add texture to the Count’s locks. 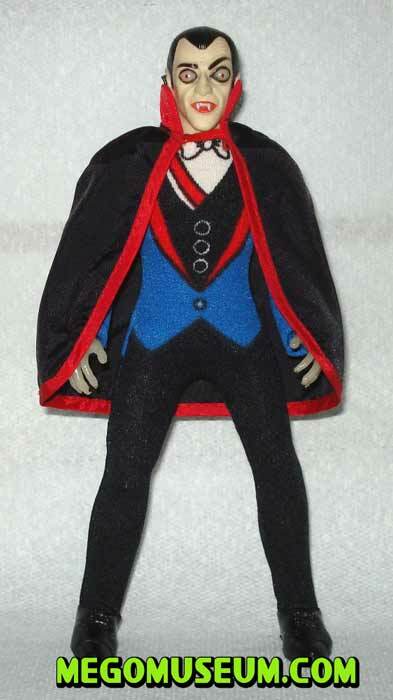 A close up of smooth haired Dracula, who is quite difficult to find (Picture courtesy of Charlie Balicki. 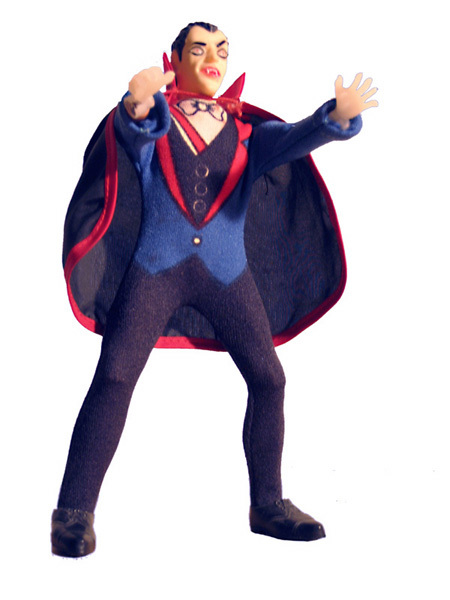 Sculpted haired Dracula retained the widest release of all Mad Monsters figures and remains the most commonly found on a type one body. Dracula was released on a type two body as well but these can be prove difficult to find. Picture courtesy of Charlie Balicki. 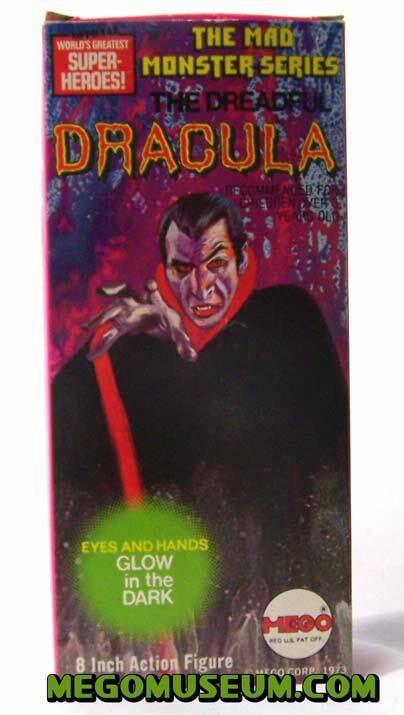 Dracula is most commonly found packaged in his original solid box although out of the four monster figures he is the most elusive. All of the Mad Monsters were released on Kresge Cards and remain difficult to find. 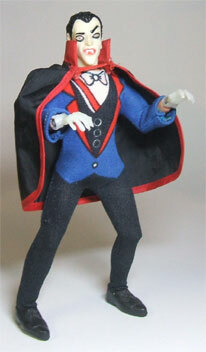 Kresge Dracula from the collection of Charlie Balicki. Mego briefly released the Mad Monsters in window boxes, one of the tougher sets to complete. Here, super collector Charlie Balaicki has placed a MIB smooth haired Dracula next to a regular sculpted hair, it makes you drool. 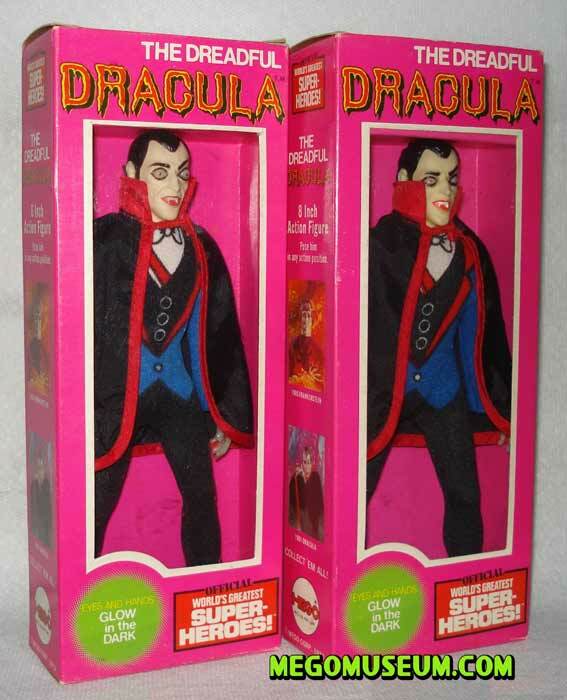 Dracula’s suit has been reproduced by Classic TV Toys. The reproduction is stiffer and heavier feeling than the original and has a few small design differences. The front of the blue coat on the design is longer and more pointed on the reproduction and the bow tie is smaller. Most of the reproductions were sewn very low in the crotch area. The colors on the repro are not quite as bright as the original suit. The reproduction is unmarked. 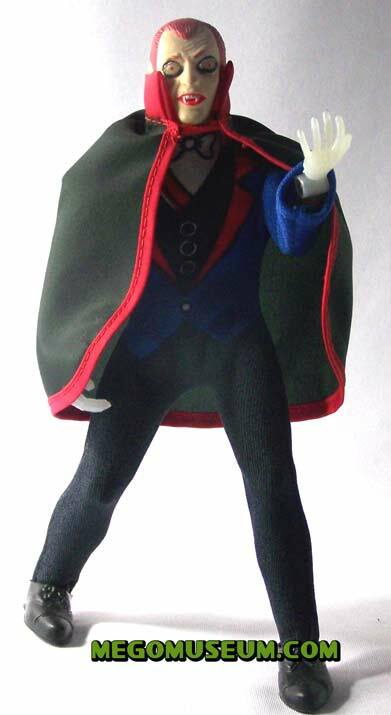 Drac’s original cape is tailored to fit around his shoulders and over the front of his arms. It also has a tall red collar and an elastic piece that holds the cape around the neck. The Lion Rock release of the figure features a slightly different cape. Instead of the elastic, it has a snap on the front which closes around the neck to hold the cape on. 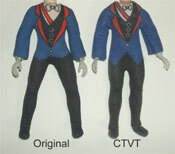 The Mego version of the cape has been reproduced by CTVT, but it is not so tailored, it’s more of a rounded shape, nor does it have the tall collar. The repro is unmarked. 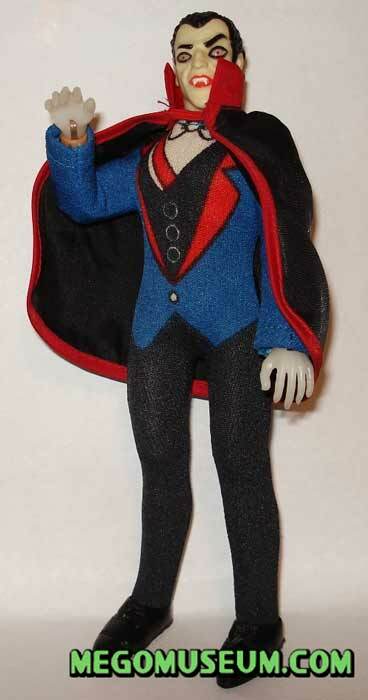 The pointed toe dress shoes Dracula wears can also be found on the Wizard from Mego’s Oz line of figures. 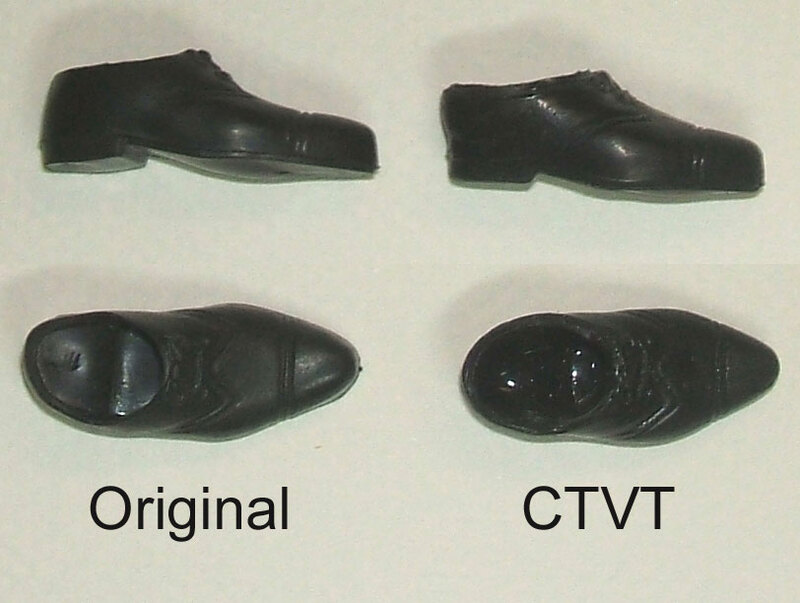 Thes shoes have been reproduced by CTVT. The reproductions are a little more glossy looking, are a little shorter, and have some flashing evident. The reproductions are unmarked. Original Drac, like the other original monsters, has glow in the dark eyes, which sometimes suffer from what is called “eye melt”. The material used in the making of the glow in the dark eyes can sometimes turn to goo. 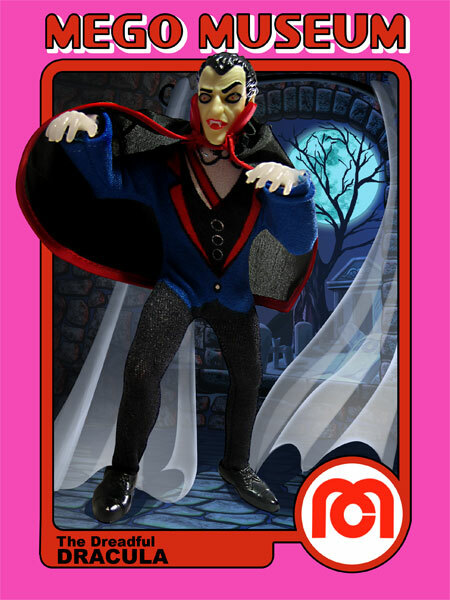 Drac’s head has been reproducted by CTVT but without the plastic made glow eyes, the repro head has painted glow eyes. The CTVT head is a little wider and the features are not as defined. The repro is unmarked.